Vellore was scheduled to go to polls on April 18 with 38 other parliamentary constituency seats in Tamil Nadu. Lok Sabha polls in Vellore constituency was cancelled after President Ram Nath Kovind accepted the Election Commission's plea. 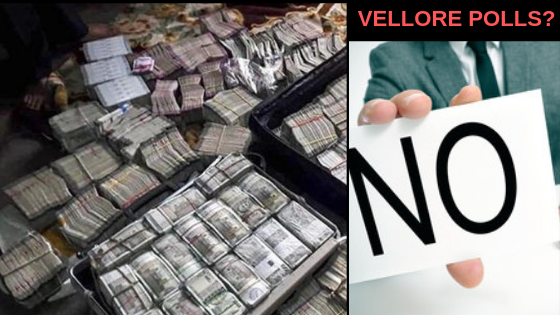 Polling in Tamil Nadu's Vellore Lok Sabha constituency has been cancelled, the Election Commission said on Tuesday, April 16, following the seizure of at least Rs 12 crore in cash from a DMK leader's associate in raids by Income Tax officials earlier this month. The confirmation came after President Ram Nath Kovind accepted the EC's plea to cancel voting in Vellore. Vellore was scheduled to go to polls on April 18 with 38 other parliamentary constituency seats in Tamil Nadu as part of the second phase of general elections. Reacting to the development, DMK President MK Stalin said it has been done to defame his party, while DMK Treasurer Duraimurugan, whose son DM Kathir Anand is the party's candidate from the Vellore constituency, called it a "murder of democracy". On the other hand, senior AIADMK leader and Tamil Nadu Fisheries Minister D Jayakumar demanded that the Election Commission disqualify the candidate indulging in such malpractices. According to a senior IT official, the cash, amounting to about Rs 12 crore, was for distribution ward wise, with the packets having division and ward numbers written on them. It, however, said that the search team observed that evidently there was a removal of material including the control panel of the CCTV as well as hard disks of computers. The poll panel said that the fact that the claimant does not have any explained source of income and that the documents found with the cash pertaining to an institution run by the family of the DMK candidate lay bare the nexus. Tamil Nadu's Chief Electoral Officer Satyabrata Sahoo, in his report on April 12, also said that the cash seizure along with evidence in the form of computer printouts detailing proposed assembly segment, ward and booth wise money distribution suggests a clear-cut pattern and design induce the electors at a large scale vitiating the electoral environment. "In the Commission's considered opinion, allowing the current electoral process to proceed and conducting the poll in the constituency on April 18, 2019, as scheduled, in such a vitiated atmosphere would have severely jeopardised the conduct of a free and fair election," the statement said.